As Gamecock fans we will never forget the 6' 8" DE from Beaufort, South Carolina. Taylor's first play as a Gamecock was a forced fumble which led to the only TD of the game and sealed the win against NC State in 2009. From the very start, Devin showed that he was a natural football player who loved to break up pass plays and make his presence felt on every single down. South Carolina has had no lack of talent on the defensive line over the past years and for that Taylor may of been overshadowed at times. When you go back and realize exactly what Devin Taylor accomplished at South Carolina you may be a little surprised. 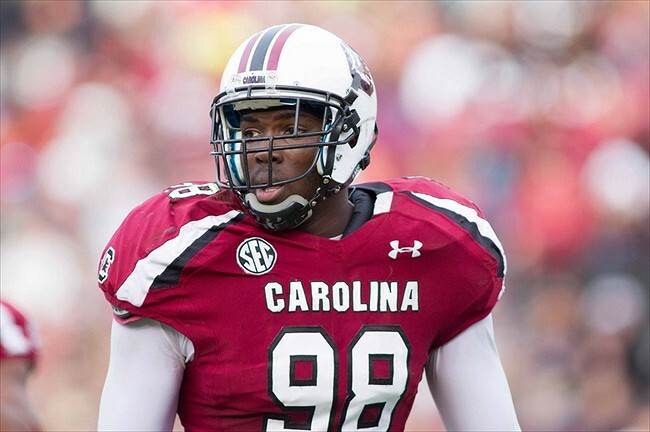 Taylor finished his career at South Carolina with 161 Tackles, 35 TFL's, 18.5 Sacks & 22 QB Hurries. He ranks 6th in sacks and tied for 2nd in TFL's all time as a Gamecock. But, you don't have to read a stat sheet to tell the type of player that Devin Taylor is, all you had to do is watch the tape. Taylor always made a play when we needed it and gave his opponent trouble every single game. The guys who judge talent for a living in the NFL watched the tape and they liked what they saw. Devin was drafted to the Detroit Lions in the 4th Round and is already making waves as preseason camp has started in the NFL. In a recent interview with NFL Radio, defensive tackle Ndamukong Suh said he believes Taylor can be a dark horse this year. Taylor is impressing in Detroit and working hard to develop new attributes to his game at the next level. Keep an eye on the Lion's this year and don't be surprised to see Taylor take the field on Sunday's as a starter. We caught up with him in this Block C Blog edition of "On The Block". BCB: Where were you when you first got the call that your were drafted to the Detroit Lions? Tell us what that moment was like for you personally? DT: "I was with on my way to go out to eat with one of my former teachers from high school, that I had become friends with. Me and my best friend "Scoop" were watching the draft, as we were about to leave we saw Marcus get picked up by San Francisco. I was sitting there talking about, it would funny if I were to get picked up right. Almost right after I said that, I got the phone call saying I was going to Detroit. It was an awesome moment in itself to just get drafted cause of how rare it actually occurs." BCB: Tell us about your experience at the East-West (Shrine Game) How important was it for you to play well in that game? DT: "A lot of people had different questions about me as to what happened during the season as to why I didn't have as many sacks as to the previous years and whether I could be physical and stop the run so it was very important for me to perform at a high level everyday." BCB: A lot of players are nervous on their first start in college, On your very first snap you forced a fumble that eventually led to the only touchdown against NC State. You finished with 6 tackles, 2 forced fumbles and a sack. Tell us what you remember about that first start. DT: "Our projected starter had just got into a fight with a bouncer the previous week (Clifton Geathers) and so Steve suspended him for the first half of the game or something to that nature. My defensive line coach was a nervous wreck the entire week, especially in warm ups cause I was kind of messing up in those. He knew I had the practice to be ready to play but since I never had any real game time experience it had him making me more nervous than what I was already going to be. Then the kick off occurred and I took the field. My coach and defensive coordinator knew they were going to test me early to see how I would handle it and so he called an end stunt that would send me inside and freeze the tight end. Next thing I knew I was one on one with the running back and he tried juking me but I knew the only I needed to do was just somehow get him on the ground and not let go. In the process of doing so I reached around and forced the fumble that got picked by Norwood to inside the 5 yd line. None of us knew how crucial that play was actually going to be until the end of the game when our offense didn't score the rest of the game. Then, the following series I blocked a punt and almost was able to pick it up and score but it was hard to locate from the way it deflected off of his foot. I finished the game with a TFL , a sack, 2 ff and I guess 6 tackles along with the blocked kick. I still didn't receive a game ball afterwards for doing all of that." BCB: What is your most memorable game or play at Carolina? DT: "My most memorable play was probably when I scored on my pick 6 against Tennessee." BCB: Was there anything from the Combine, Pro Day or East-West Game that may have given you any indication that the Lions would draft you? DT: "No clue. I talked to them at the Combine and East-West Game but I didn't know as to how much interest they actually had in me." BCB: How do you feel the Lions defensive scheme matches up for you? DT: "It matches up a lot by allowing me to use my speed and range to which I was most known for at the time to get off on the ball and make plays on the ball carrier as well as quarterbacks." BCB: You played with Eric Norwood, Melvin Ingram and Jadeveon Clowney. What is one thing you may have taken from any one of these guys that you've incorporated into your style of play? DT: "Norwood, with just his hustle to rush and be everywhere on the field and near the ball all the time." BCB: Chaz Sutton had five sacks last season as a reserve. What kind of season do you see him having as a starter this season? DT: "If he does what he needs to do in the off-season to help come off the edge, he should have more this year." BCB: What was your reaction on the sideline when you saw Bruce Ellington trot into the end zone against Michigan for the game winning TD? DT: "It was a great moment right after to bring the momentum back to our side right after the "The Hit"." BCB: You had 15 pass break ups and 2 interceptions while at South Carolina, pretty gaudy numbers for a defensive linemen. How were you able to be so active at the line of scrimmage by getting your hands in the air and getting all those knockdowns? DT: "Coach always told us PBU's (Pass Break-Up's) are almost as good as a sack and with the height and length we have, if you don't get directly to the QB, get your hands up and you can possibly knock down some balls and get a pick as well." BCB: What are your goals as a rookie and how do you see yourself making an impact on the defensive side of the ball during your rookie season at Detroit? DT: "My goals are to make the roster and get some PT on the field whether it be on special teams or defense. Any way to really make some kind of difference on the field. I think I can make an impact cause I'm a little bigger style end than they wanted to have to play into their scheme of play"